This $50 HTC Dash sequel has already been announced for other carriers under names like the Snap, but now it's coming to Verizon as the HTC "Ozone." It's a Wi-Fi-wielding 3G QWERTY worldband (complete with international plugs!) Windows Mobile 6.1 smartphone that runs a palatable $50 with contract. It goes on sale online June 29 and in stores July 13th. BASKING RIDGE, N.J., and BELLEVUE, Wash. – Verizon Wireless and HTC today introduce the Verizon Wireless HTC Ozone™. This easy-to-use smartphone combines a simple design with a host of connectivity options that include the nation's largest wireless 3G network, global roaming and Wi-Fi, making it a smart option and, at $49.99*, a great value for first-time smartphone users or savvy business professionals. · The HTC Ozone will be $49.99 after a $70 mail-in rebate with a new two-year customer agreement. Customers will receive the rebate in the form of a debit card; upon receipt, customers may use the card as cash anywhere debit cards are accepted. · VZ Navigator is available for $9.99 monthly access, and Visual Voice Mail is available for $2.99 monthly access. · Customers can purchase the HTC Ozone beginning June 29 online at www.verizonwireless.com, by calling 1-800-2 JOIN IN, or through business sales channels. 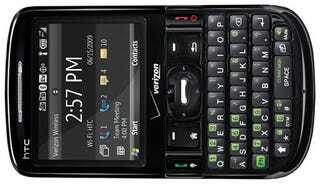 It will be in Verizon Wireless Communications Stores on July 13. For additional information on Verizon Wireless products and services, visit a Verizon Wireless Communications Store, call 1-800-2 JOIN IN or go to www.verizonwireless.com.